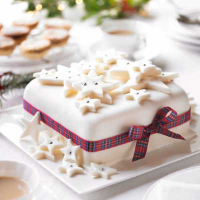 If time is running out for you this Christmas then this very easy recipe is perfect. There is no need to soak the fruit overnight so it's much faster to prepare - it's also ready to eat as soon as it's cooled. It's so deliciously rich and fruity that no one will guess you've made it so quickly! 3. Preheat the oven to 150°C, gas mark 2. Tip the cooled, soaked fruit into a large mixing bowl. Stir in the beaten eggs, sieve in the flour, baking powder and spices and mix well, until thoroughly combined. Pour into the prepared tin and bake in the oven for 1.5 hours, or until the top of the cake is a little cracked and dry to touch. A skewer inserted into the cake will still come out a little sticky, but the cake will be ready. Discard the brown paper from around the tin, to allow the cake to cool more quickly. Spike the top with a cocktail stick and drizzle over the remaining cherry brandy. 5. To ice the cake, gently warm the jam in a small pan with 1 tablespoon cold water until melted. Sieve into a small bowl and, using a pastry brush, cover the cake with the warm jam. 6. Knead the marzipan until softened, then roll out thinly on an icing sugar-dusted surface, to make a 40cm round. Drape it over the cake, pressing down to cover. Trim off any excess around the base, then repeat using the fondant icing (don’t use jam this time). Using star-shaped cutters, cut out a selection of stars with the remaining icing. Press silver balls into the middle of some of the stars, then pile into the centre of the cake. Tie a ribbon around the cake too, if you wish. If you don't have any cherry brandy then ordinary brandy would also taste great. Or replace with same quantity of orange juice and/or water for an alcohol-free version. This recipe was first published in Wed Nov 13 13:08:00 GMT 2013.